This topic contains 4 replies, has 2 voices, and was last updated by wei shen 3 years, 7 months ago. Is it possible to replace the default product categories widget at the left side of the main page to a customized widget? I did not understand your question clearly. Can you please make the question clearer. What you exactly want to do with the customize widget? Sorry, I didn't describe my question clearly. In the main page, at the left hand of sliders, we have product categories list. For example I want to replace this one by another widget. What should I do? In addition, could you give some hint about how to customize the components in this section. Because I can change the widget in header sdiebar or home sidebar, but I found no way to change in this part. Please follow these process to show a widget in the frontpage. Step 3: Now navigate to themes/dokan/front-page.php. Copy the front-page.php to the child theme which is themes/dokan-child/. 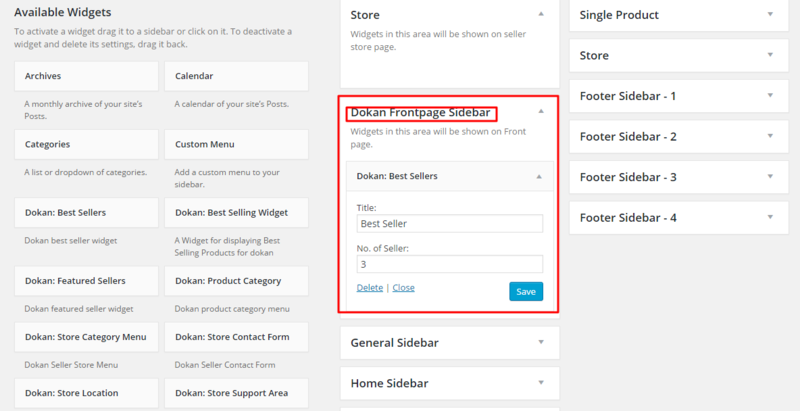 Step 6: Now, drag a widget to the “Dokan Frontpage Sidebar” and you will get a new widget into the frontpage sidebar. It's clear. Thank you for your help Towhid. The topic ‘Product categories widget’ is closed to new replies.